Do the cold weather and gray skies of winter have you longing for a day at the beach? There’s no time like the present to plan your next beach vacation. We’ve rounded up our top three favorite family-friendly beach destinations – each with its own unique appeal. Located on Florida’s Gulf Coast, Clearwater Beach is 2.5-miles of crystal blue water and soft, powder-white sand. The area is also home to a vibrant entertainment scene. Hop aboard a dolphin cruise or set sail on Captain Memo’s Pirate Boat. Visit world-famous Winter the dolphin at the Clearwater Marine Aquarium. Settle in to watch the sunset at one of the many beachside restaurants and be sure to check out the nightly entertainment along Pier 60. Amenities: Cabana rentals, water sport/beach gear rental, lifeguards, restrooms, beach showers, a covered playground, fishing pier, marina and plentiful restaurants and souvenir shops. Accommodations: The beach is lined with accommodations that range from classic Florida beachside motels to five-star resorts. Condo rentals are plentiful on nearby Sand Key Beach, which is just a short drive south across Clearwater Pass. When to go: Year-round sunshine and warm temps mean you can head to Clearwater Beach any time of year; however, May and October are great months to skip both the rainy season and the crowds. This pristine island off the coast of South Carolina boasts a laid-back, lowcountry vibe perfect for relaxing. There are 12 miles of white sand beach that line the island, with six public access points. Coligny Beach Park (featured image) offers tons of family-friendly amenities and is also just across the street from a number of shops and restaurants. After a day at the beach, be sure to take advantage of the island’s numerous kid-friendly activities. Take a cruise on the Black Dagger Pirate Ship. Go for a horseback ride. Explore all the hands-on fun at the Sandbox, an Interactive Children’s Museum. And discover the island’s rich nature at the 68-acre Coastal Discovery Museum. 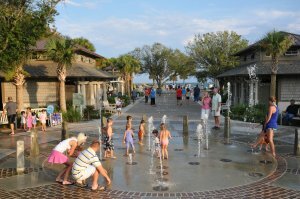 Amenities: Coligny Beach Park offers outdoor showers, changing rooms, restrooms, seasonal life guards, beach matting for wheelchair access, and beach chair and umbrella rentals. Accommodations: From vacation homes and quaint inns to oceanfront resorts, there are accommodations for any budget. Full-service resorts like Palmetto Dunes are great for families who prefer to have all of their amenities and activities in one place, including a private stretch of beach. When to go: The summer months are prime time in Hilton Head. Go in late April/early May or October for gorgeous weather and smaller crowds. If it’s sand you seek – lots and lots of sand – head to Sleeping Bear Dunes National Lakeshore, home to 35 miles of unspoiled Lake Michigan shoreline dotted with a number of swimming beaches. North Bar Lake Beach features shallow, clear water over a sandy bottom, making for a warmer and safer swimming experience for little ones. For those who prefer refreshingly cool water and waves, Lake Michigan is just a short walk across the low dunes. Kids will love tackling the Dune Climb just north of Empire – the reward is breathtaking views of Glen Lake. At the Maritime Museum in Glen Haven, kids can take part in Heroes of the Storm, a re-enactment of a turn-of-the-century shipwreck rescue designed especially for children. There is also ample opportunity for hiking, biking, tubing and canoeing throughout the park. For a slower pace, take a drive along the seven-mile Pierce Stocking Scenic Drive. Amenities: Facilities throughout the park are minimal. This area focuses more on a love of the great outdoors than modern amenities. Accommodations: There are no overnight accommodations or restaurants in the national park; however, there are plenty of options in nearby communities like Glen Lake and Empire. Visit www.nps.gov/slbe/planyourvisit/nearbyattractions.htm for more information. There are two campgrounds within the park that are available on a first come, first served basis. When to go: The summer months are the best time if you have swimming in mind. Go in late June to get ahead of the crowds. September and October are great months for hiking and leaf peeping.